Origin: Considered to be African in origin, but found in the United States around 1900 and now spread into all states. It is more common in warmer southern states than in the northern areas. 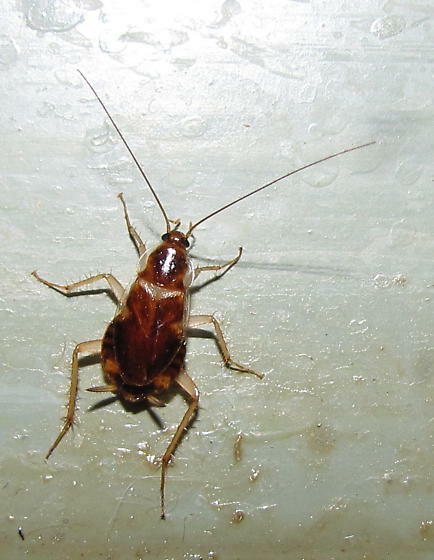 Biology: This roach species is found primarily indoors, where it may be as common in dry areas of the structure as it is in the kitchen or bathrooms. 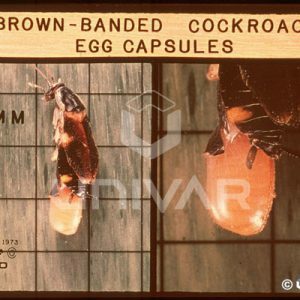 It has a low moisture requirement, allowing it to survive in many locations, and the females deposit their egg capsules within about one day of its development, sticking them to hidden surfaces in closets, behind drawers, within corrugated cardboard, or behind objects on the walls. 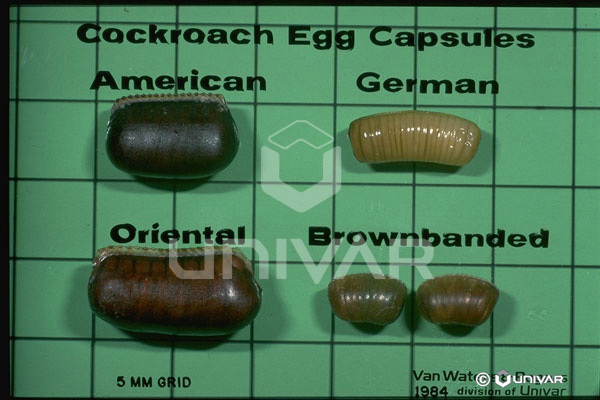 Each capsule contains an average of 15 eggs, and development from egg to mature adult takes about 6 months. 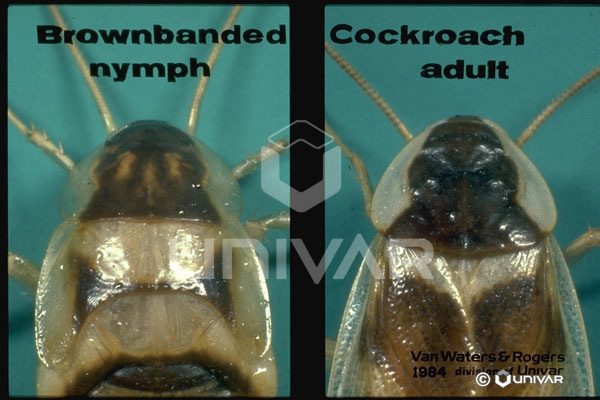 Males have wings that completely cover the abdomen, while the females wings are shorter, exposing the last few segments of the abdomen. Both sexes can fly. 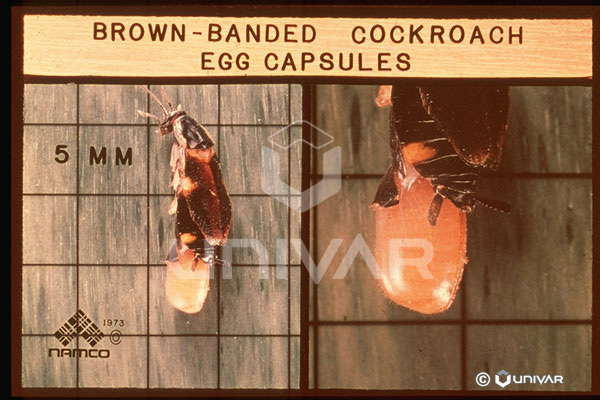 Because of the manner of hiding the egg capsules on materials, this species is easily relocated to new habitats. 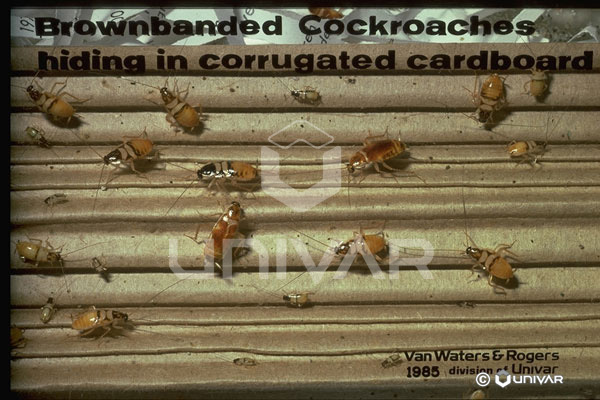 Identification: The brown-banded cockroach is named for the two wide stripes running side to side on its thorax and abdomen, seen even through the opaque wings on the adults. Females have shorter wings than the males. 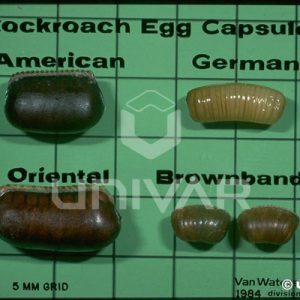 Overall length is only about ½ inch, and the color is a yellowish brown in the males to a darker brown in the females. The top of the prothorax is a solid dark brown color. Characteristics Important in Control: Elimination of habitat and access to voids is important, along with removal of potential food sources. 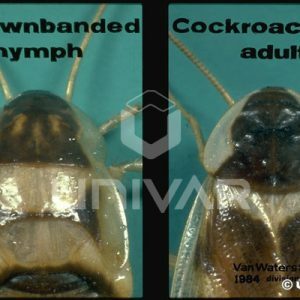 It must be kept in mind that these roaches can inhabit any room in a structure, and an inspection to discover and remove hidden egg capsules will be important. 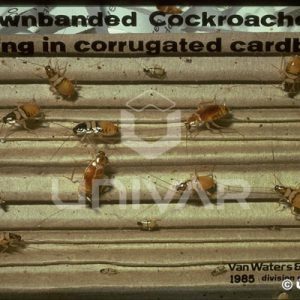 Crack and crevice applications of a residual insecticide are effective, along with the use of cockroach bait products near their harborage sites.